Although it’s not the first dual setup out there, the Hell’s Gate Mechanical Mod by YEP is a unique device that includes two side by side 510 connections for using two atomizers simultaneously. Not only does it include two YEP RDA’s that you can fire individually, but it comes with a special top cap so you can use both at the same time. We’ve never tried two RDA’s at once, but it’s safe to say that it will create massive clouds! 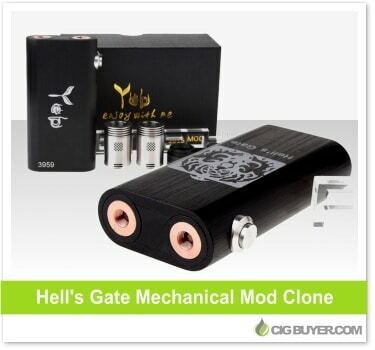 Made from aluminum, the Hell’s Gate Mod includes PCB protection and houses two 18650 batteries.